Étretat has the full assortment of eating places: sandwiches from a boulanger, beachfront pizza and pasta, and Normandy seafood in a refined atmosphere. Étretat restaurants in the town center are mostly suited to beach-holiday hunger: pizza, pasta, light meals and traiteur (French delicatessen) snacks and light meals for picnics. Try Le Romain d'Étretat, 1 rue Georges Bureau, for these dishes, and Lann-Bihoue, 45 rue Note-Dame, for crêpes. 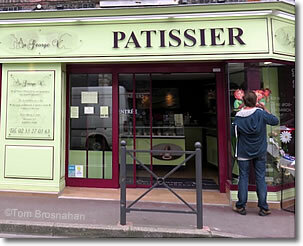 For a finer dinner, look for Le Bistretatais, 17 rue Adolphe Boissaye, where fresh seafood is a specialty. For a special occasion, try the family-run restaurant named Le Bicorne, 5 boulevard du President Rene Coty. For us, the best bargain in picnic fare is at a boulanger-patissier (bakery-pastry shop), where fresh-cut sandwiches, quiches, and of course those delicious French pastries are sold to take away. 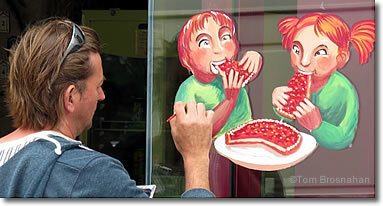 What's that guy doing at the window of the pastry-shop?